This entry was posted in News, Our adventures and tagged andean expeditions, Andean Summits, Bolivia, bolivia mountaineering, bolivian mountain guides, climbing and trekking, climbing bolivian mountains, Condoriri, eduardo Mamani quispe, hiking bolivia, ice climbing bolivia, illampu, Illimani, sajama. Bookmark the permalink. Eduardo arranged an excellent 4 day trek for two of us, a variation on the Condoriri-Huayna Potosi trek. Pedro was a great guide and Rogelio a superb cook. Guido led two mules and a burro to bring our gear. The scenery was spectacular and the crew congenial. While you could do it on your own for less, the service was well worth the cost. When we arrived in camp each night, the tents were up and hot food was being prepared. We couldn’t have asked for more. I have recently had the pleasure of climbing with Eduardo, and must express my gratitude in what was an great experience. As I have quite a bit of experience in the mountains of different continents, I spent much time trying to find a suitable guide to introduce me and my girlfriend to the Bolivian mountains. 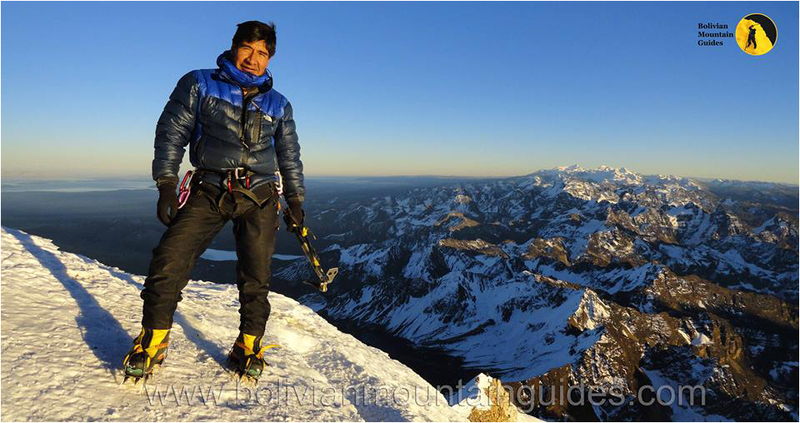 I must say that Eduardo stands out as an expert mountaineer and guide. We successfully climbed two mountains with Eduardo, Pequeño Alpamayo and Huayna Potosí, in differing weather conditions…. and his unique knowledge of the mountains, weather conditions and mountaineering are a rarity, topped with his warm kindhearted charisma…. Eduardo is surely an expert in his field. You may find cheaper guides, but Eduardo and his team offer expertise second to none!! I would like to thank Eduardo, Jose and Dora for a fantastic time in the mountains. It started out with a 2-day trip to the summit of Pequeno Alpamayo and ended with a customised 5-day trip to the summit of Hyuana Potosi, where we had extra days on the glacier to learn a few tricks and techniques for ice climbing. Although I am relatively inexperienced it seemed that Eduardo is inexhaustible in terms of alternative techniques and he certainly is an excellent teacher who makes you feel confident while you are being pushed to what is achievable for you. The summit tours were perfect too – we constantly felt the many years of experience and his perfect knowledge of the mountains. Dora cooked the most delicious food and Jose drove us to the base camps while generously sharing his knowledge on all from Bolivian mountains to La Paz life. I highly recommend Bolivian Mountain Guides and cross my fingers that future climbers needing a guide do not satisfy with a random guy from Saganada Street but try to consider also the success rate of reaching the summit, safety, quality of equipment, group size, etc. I have been traveling and living in Bolivia since 1967. In 1969 I climbed Illimani, Huyna Potosi, Mururata and other mountains in Bolivia. Some of these trips are written up in the American Alpine Journal. From 1992 to 2010 I participated in ten expeditions to the mountains and the southern Altiplano of Bolivia. Our mountain climbing expeditions included nine different peaks and the total personnel number was approximately 60. On every one of these climbing expeditions we used the Mamani Brothers as mountain guides and on some of the trips we used Trek Bolivia to help organize the trips. I mostly worked with Eduardo and Gregorio, but also with their brother Jose. I can say without qualification that these were the most dependable, safest and skillful mountain guides that I have ever seen. In addition my son Will, who was born in La Paz in 1968, climbed Illimani and Illampu with Eduardo. Currently my 15 year old daughter is thinking about climbing in Bolivia and I would only use the Mamanis as guides. All trips were conducted with a great degree of professionalism and we just used Eduardo this last year for an expedition into Southern Bolivia. I am a Professor of Pediatrics at the Children’s Hospital of Philadelphia and am especially aware of high quality in a profession. I may be reached at any time for references about the Mamanis at 610-639-0246 in Philadelphia. to get some sleep before the next day’s attempt to reach the summit. ever done – but we were so glad that we did it! 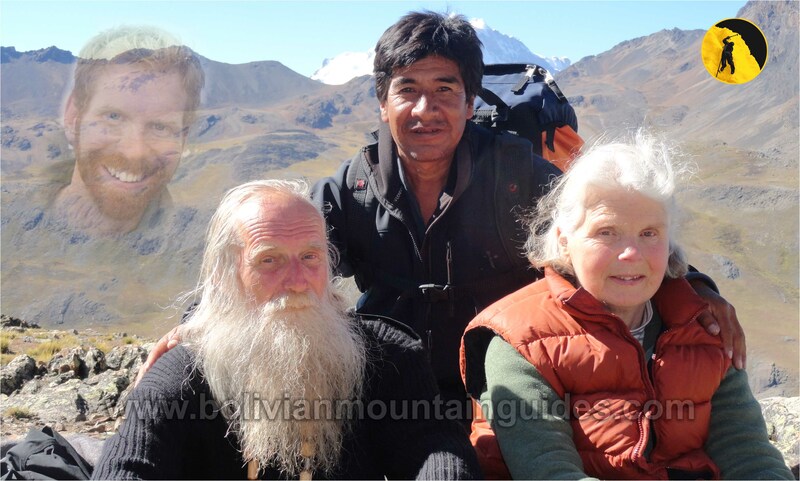 If you are looking for guides in Bolivia, the Mamani brothers are the best. These guys were born and raised in Bolivia and began climbing the mountains when they were very young, using boards with nails as their crampons. Their climbing portfolio is extensive and I’d say noone has a better knowledge and respect for the Bolivian Andes. I climbed with Bill Fox and company on various expeditions from 1993-2001. Eduardo and his bothers successfully guided me to the top of Huayna Potosi, Pequeno Alpamayo, and Jank U Laya, which was no small feat considering Eduardo had a 260 pound climber on his rope (Eduardo – I lied about being 245 pounds!). It has been awhile since I have climbed and I miss these guys very much. My travels to Bolivia were the high points of my life, opportunities of a lifetime, and time spent with the best of friends that I look back upon with supreme fondness. Some day, I hope to return to La Paz and climb with my old friends! Eduardo – Tu el Hombre!!! Saludos, el Toro. I’ve recently (April, 2011) returned from summiting Huayna Potosí with Eduardo Mamani of Bolivian Mountains and I really couldn’t be more pleased with my experience. I’ve been traveling extensively in South America for more than half of my life; back in the States I’m an avid outdoor enthusiast, but have never done much winter climbing and certainly not at the elevation required in Bolivia. Fear not! Eduardo put me at ease from the beginning. He takes safety very seriously and from the first handshake I was already aware that this was a guide attuned to details – plans, preparations, equipment, technique etc. In fact when we first met (I also explored the former Chacaltaya ski resort with Eduardo a week prior to summiting Huayna) I couldn’t help but notice that Eduardo was subtly checking out my boots, making sure I had the appropriate gear. In our stroll up Chacaltaya, at 17,800ft, Eduardo was also keen to note my footing and comfort hiking – something that would clearly influence our more rigorous hike the following week. Eduardo has to be one of the most punctual men I’ve met in South America and his attention to details exceeded that of rival companies who hiked the same trails in my opinion. Eduardo and the Mamani brothers essentially pioneered the climbing scene in Bolivia over the past 20-30 years, establishing the major hiking routes and campsites. On the trail, guides from other companies are sure to say hello to “Don Eduardo” and when there is a question about ice conditions or a teaching point to be made, the attention always turns to Don Eduardo. His extensive experience was evidenced by this peer respect. His sensibility evidenced by his calm demeanor which paced us slow and steady, allowing us to leave high camp last and yet be the first group to arrive to the summit of Huayna, whilst other guides hauled their clients like mules requiring frequent resting breaks. Finally, hiking with Eduardo will be more than a lifetime of memories of beautiful mountains and new summits. Eduardo has a lifetime’s worth of exciting mountaineering stories to share and his friendship is something that will lure me back to the mountains of Bolivia sooner rather than later. I’d be thrilled to talk to anyone interested about climbing with the Mamani’s in Bolivia. I may be reached at matt.c.weiss@gmail.com. 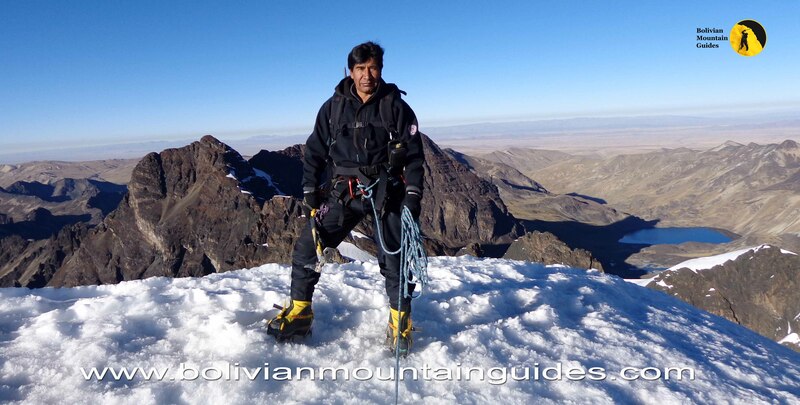 In early May 2011 we have summitted Pequenyo Alpamayo and Huayna Potosi with Eduardo. Before the climb we have been trekking with Jose for two days in the Condoriri area to acclimatise and we also met Pedro. The trek had some spectacular scenery and our tents and food were ready on arrival. Eduardo has then given us some basic ice walking and climbing training on the glacier, as we have never done it before, and we finally were ready to attempt the summits. While climbing the Pequenyo Alpamayo we were extremely impressed by Eduardo’s guiding and help. He secured our ascent and descent as well as the rock climbing part. He told us where to rest on the steepest part and helped us through the bad weather on the way out. Huayna Potosi, while a not technical climb, is a long and physically demanding uphill. Again, Eduardo was carefully monitoring us throughout and giving advice and assistance which really helped us to summit. Our experiences with Eduardo, Jose and Pedro (Mamani brothers) and their crew (cooks, porters etc) was outstanding. The trek and climbs were perfectly organised and the expertise and quality of mountain guiding has exceeded our expectations. Bolivian Mountian Guides have made our experience perfect and we gladly give them our highest recommendations. High summit success rate their customers enjoy is for a good reason. Bolivian Mountain Guides provided the best experience I have had with a mountain guiding company. They were reliable, competent, flexible and professional. From the airport pickup to end of the trip every detail was meticulously tended to. When I was told I would be picked up at nine someone was there and if the plans were changed I was always kept in the loop. Eduardo was a very personable guide. During the climb he assessed my skill level and was very flexible with rest of the trip itinerary. I was recommended but not forced with any itinerary. The food served during the trip was superb. We were always taken care of. I would recommend Bolivian Mountain Guides to any adventurer. I always felt safe and instruction received during glacier training was tantamount to my confidence on the mountain. I have nothing but high praise for this outfit. They take excellent care of their clients. Eduardo was right, the life of a mountaineer is difficult. But I can say from experience that Eduardo and his team make living in the mountains far more enjoyable. I met Eduardo while climbing Pequeno Alpamayo with another guide service. Unfortunately our guide for Alpamayo did not provide us with sufficient food. When Eduardo found out, he graciously brought us a bunch of papaya, honey, bread, and tuna and asked for nothing in return. It was one of the most generous acts of kindness I had seen. After joking around with him for a couple hours, I knew we would soon climb a peak together. I had been planning on climbing Sajama and began discussing it with Eduardo. He gave us considerably more information about the peak than anyone else I had talked to (including the other guide service we had paid for). It was an easy decision to climb Sajama with him. Eduardo and his team did an incredible job assessing my skill level and really made the climb fun! After a couple days together, the climb was more like a trip amongst friends than a paid expedition. I highly recommend Bolivian Mountain Guides to anyone looking to climb big peaks in Boivia. Procurei no web site dos guias de montanha- Bolivia um guia com experiencia em Andinismo, encontrei Eduardo e este me ensinou importantes tecnicas de escalada em gelo e dicas para conseguir chegar ao topo de Huayna Potosi. Recomendo Eduardo e sua equipe quando for a Bolivia procurar aventura em alta montanha. For my trip to the Bolivian Andes in August 2011 I chose “Bolivian Mountain Guides” to organize this expedition and to guide and accompany me – and it turned out to be an excellent choice. In preparation for this trip Eduardo Mamani Quispe and I had exchanged a whole series of emails to work out in detail a tailor-made program for this expedition and already in this phase Eduardo´s friendliness, flexibility and customer orientation became obvious. After arrival in La Paz I spent some days in the Cabana Chakaltaya to ensure a good acclimatization phase. During these days I climbed the nearby Chakaltaya Peaks. After two days in La Paz we started to Parinacota and Pomerape. My guide was Jose Mamani Quispe, the younger brother of Eduardo. In the High Camp at 5.150 m unfortunately I got some health problems which made us change our plans regarding the twin volcanoes. Instead we decided to move to the Condoriri Group. At the Lago Condoriri we established our Base Camp at an altitude of 4.650 m. From there we climbed – with a High Camp – Pico Austria (5.358 m) and in another two-day-trip Pico Tarija and Pico Diente (5.358 m). In both cases we had beautiful weather and an amazing view to the other mountains of the Condoriri range, to the Huyana Potosi and a lot of other peaks of the Bolivian Andes. After more than 50 years of mountaineering in many parts of the world I can whole-heartedly recommend Bolivian Mountain Guides as an excellent organization for mountain expeditions in the Bolivian Andes. It was a great pleasure for me to climb with Eduardo and Jose. The expedition was very well prepared in every detail. In contrast to many other expeditions with other operators each piece of the equipment was in very good shape. Eduardo and Jose as well as all other staff were very friendly and helpful. It was no problem whatsoever to change plans after my health-problems. I would like to thank Eduardo and Jose very much for the nice and successful days we spent together. If I return to Bolivia in the future, I will without any doubt chose again Bolivian Mountain Guides as tour operator for my expeditions. Eduardo led our climbs to two 5000+ and one 6000+ meter high mountain. Eduardo is a very experienced IFMGA guide with a lot of climbs in the Andes under his belt, which was both reassuring and gave us the opportunity to go places few people had gone before. Eduardo’s knowledge of the mountains, focus on safety and his good humored character made him the perfect guide for our climbs. We recommend him wholeheartedly. Eduardo, thank you! rare Andean condors soared overhead, were spectacular. Eduardo encouraged frequent stopping and photography to appreciate the sights along the way. Eduardo is a strong climber and professional guide, and his friendly personality and sense of humor will ensure you have an unforgettable experience in Bolivia. Upon doing some research on the Internet, I was able to connect with Eduardo Manani in Bolivia. Eduardo is a renowned climbing guide and upon checking references and Eduardo’s video I decide he would be the right person to guide me in my climbing quest to that part of the Andes. By phone and e-mail, Eduardo was very helpful to discuss the alternative sites for the climb and provided good information about the gear I shall bring with me and the ones I could rent locally, such as the tent, sleeping bag, axes, ropes, plastic boots and crampons. He was always friendly and responsive and his suggestion to climb the Tarija glacier in the Condoriri region was a perfect choice to my goal of summiting a peak over 5.000m (16,404 ft). Unfortunately upon my arrival in La Paz, Eduardo contacted me by e-mail to inform that he would not be able to guide me, but he told me that he had made arrangements to have his brother Gregorio to go with me. Since I had already checked the Manani’s brother references I was fully confident with Gregorio’s experience I saw no reason to change the plans and decided to go ahead. Next day in La Paz, I meet Gregorio to get to know him and he helped me with renting the extra gear I needed as well as he gave me a very detailed briefing about the climb and the logistics to get to Lake Chiar Kota were we would mount our base camp. We then agree that he will meet me next day at 2:00pm in the hotel with the transport to the Condoriri area. And exactly at 2:00pm Gregorio was in the hotel lobby to pick me up. The trip to the lake took 3 hours by car plus a one hour and 30 minutes trekking thru an easy up-hill trail. My concern to have to carry a big load at that altitude was relieved when he told me that a mule would do the heavy lift to base camp. Gregorio and I got along very well. He was always helpful. He mounted the tents and gave me a lot of information about the mountains and the culture of the region while we were trekking. With his knowledge of the mountain weather, he helped to choose the right clothes to attack the summit next day. After a light meal we went to rest and woke up at 2:00am to begin our journey to the base of the glacier, where we changed our trekking boots for climbing ones, set on the crampons and roped ourselves in Alpine style. Carefully I checked all the knots and was pleased to see that Gregorio had made them according to the strictest climbing standards. Five hour later we summited at 5.268m (17,294ft) under a beautiful blue sky. Gregorio was a fantastic climbing partner, always friendly and he never tried to push me beyond my own pace. He was always giving me a lot of encouragement and confidence to achieve my goal and did show me some very important tricks to make the climb more safe and pleasant. I have no doubts to recommend the Mamani brothers for a climbing or trekking adventure in the Bolivian Andes. They are open and humble people, very pleasant to be with, but above all, they are very knowledgeable of their métier which translate in a sense of security and peace of mind for their clients. Having said that, it is important to say that I have now plans for summiting a 6.000m and my eyes are targeted to the Huayana Potosi (6.088m – 19,973ft) and off course, I would ask the Mamani brothers to guide me once more. In June my brother, James, and I climbed Huayna Potosi with Eduardo. It was the first major climb for my brother and I but Eduardo has guided our dad and older brother on many successful climbs of Bolivian mountains so we knew we were in good hands. We set out on the first day with Eduardo in the morning and arrived at Base Camp around noon. After a nice lunch in the refugee where nearly everyone knew Eduardo, he took us to a nearby icy area to get our first real experience with crampons and ice axes. Eduardo was very patient and made sure we were well prepared for the trek up to the high camp. The next day we made our way up to the high camp in time for lunch and then continued further up the mountain to our campsite. Eduardo made sure we had all of our gear packed for the summit tomorrow and made sure we went to bed early to prepare for our 3 am departure from our camp the next morning. At 2 am our alarms went off and we tried to force down some food and get ready to leave for the summit. Eduardo kept a steady pace the entire time and provided pump up music on his phone for the long trek. We successfully reached the summit around 7:30 and we believe I am the youngest non-Bolivian female to reach the summit at age 17, and the 2nd youngest woman in general. I would definitely recommend Eduardo to climbers of all ages and skill levels and he is one of the strongest men you will ever meet! He is also very friendly, safe and professional.